TheStreet.com writes how Sublet.com is a valuable resource for finding apartments to rent in Berlin and other European and American cities as well. If you like history, you'll love Berlin. The German capital is no longer divided between world powers, but Berlin still bears the mark of its historical past while mixing in modernity. From the symphonies of Beethoven, the horrors of two World Wars, the covert operations of the Cold War to the flowering of freedom and modern European internationalism, the city is a mix of beauty, European flair and powerful historical reminders. 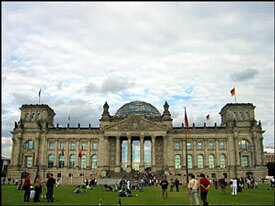 Berlin is a prime European destination, so hotels can be found at levels ranging from budget to five-star. However, many Berliners have extra apartments or rooms in their apartments that they rent out to travelers -- be it a solo vacationer or families -- for competitive prices. For a realBerlin experience, I recommend this route. On my second day in Berlin, I was on a balcony overlooking a 300-year-old church watching the sun set, drinking tea and eating fantastic chocolate with my charming German hostess, discussing politics and culture while enjoying the view. You can't get that kind of experience at a hotel. There are many ways to find either private apartments or semiprivate rooms, but the easiest way is through services that act as a middleman to connect you with owners who wish to rent. You make your arrangements with these services and pay them directly. 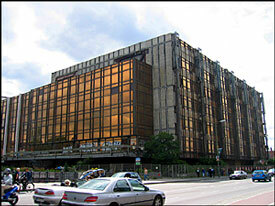 English is the preferred international business language in Berlin, so booking these apartments shouldn't be difficult. A service I used before I arrived in Berlin is Euro Flat, which connected me with a place the site's manager thought I would like. Another more well-known service is Sublet.com, which has apartments not only in Berlin but in other European and American cities as well. Like most major European capitals,Berlin has excellent public transportation. The city has light-rail trains that run to just about anywhere you'd want to go, making it easy to get around. For something a little more adventurous, travelers can "borrow" one of the many publicly available bicycles throughout the city.Berlin has a system of bicycles that can be rented for as long as you want -- and easily paid for with a credit card, by dialing the number on the bike with your mobile phone. You can ride the bike to your destination and lock it up, keeping it for your return, or leave it there for the next renter. Berlin also is a great city for hours-long strolls through history, or short walks in fashionable districts with excellent restaurants. A walk down the city's Unter Den Linden is a must. It's on this avenue (literally "Under the Linden Trees") where you can see some of the most impressive sights in German culture and history, including the original handwritten score for Beethoven's Ninth Symphony in the State Library; the Pergamon Altar in the Pergamon Museum; the majestic Berliner Dom church; and the bizarre-looking, former East German seat of power, the Palast Der Republik. This landmark (described in some tour guides as "grotesque") is slated for destruction soon, so you'll have to hurry to see this major marker of the former Communist East Germany. "Ich bin ein Berliner." When, during the Cold War, President Kennedy intoned these words in front of the Berlin Wall as a gesture of solidarity with the West Germans, little did he know he was rather confusingly implying, "I am a doughnut." To say "I am a Berliner" the phrase is, "Ich komme ausBerlin." It's a cultural detail like this that can be the difference between a fun trip or a confusing one. Germans, like many Nordic peoples, have a reputation for not being as open as other Europeans, but that doesn't mean you can't engage them. Many Berliners (especially the younger ones) speak English, so you'll have little trouble asking for directions or getting information. That said, learning a little German helps immensely. A courteous "Sprechen Sie Englisch?" ("Do you speak English?") can break the ice. And, like your mom taught you, always say thank you -- "danke." 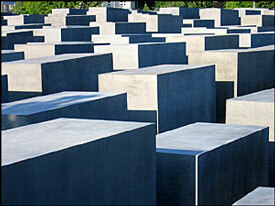 As the center of two world wars, as well as the Cold War,Berlin offers much in the way of history. It's still possible to find examples of the street fighting that went on during war battles, as evidenced by the bullet-pockmarked walls in the Hackesche Höfe in Mitte or the bombed-out remains of the Kaiser-Wilhelm-Gedächtniskirche church in West Berlin. It's been 16 years since the Berlin Wall stopped dividing the eastern and western portions of the city, but there are visual reminders ofBerlin's past as a focal point of the Cold War. Only small sections of the Wall remain, the longest of which is in the East Side Gallery in the Friedrichshain district. Here, local and international artists were given sections of the Wall to paint in 1990, many of whom chose messages of hope and the triumph of the human spirit as their subject matter. This being Germany, beer is available in just about every place you find food, even coffee shops. The local specialty is Berliner Weisse, a light, somewhat bitter beer not unlike Budweiser, which is sometimes drunk with a shot of woodruff or raspberry syrup. Other common varieties are Weizenbier, a light wheat beer great for summer days; Schwarzbier, a dark, full-bodied variety; Dunkelbier, a dark ale; and Bock, a strong seasonal beer, often flavored with spices. Try surprising your new German acquaintances by ordering an Alster (beer with sparkling water) like a local. For the more adventurous, ask for a Diesel, which is lager with orangeade or Coca-Cola. If you have only a day or two in Berlin, spend your sightseeing time in the East, where many of the major and most interesting sights are concentrated. Scheunenviertel, the historic Jewish quarter of the city, is a hotbed of art galleries, boutiques, bars and restaurants, not unlike New York's SoHo neighborhood. It's there you can see street art in the courtyards of Hackesche Höfe, have a world-class sushi dinner at trendy Pan Asia, go shopping on Rosethaler Strasse for fashions that haven't even made it to the world stage yet, take in entertainment like Yiddish theater at the Hackesche Hoftheater, and spend some time and money in one of the many bars and clubs that dot the area. The aforementioned Unter Den Linden is a sightseer's boulevard full of museums, cathedrals, shops, and, at the westernmost end, the iconic Brandenburg Gate. Just off of Unter Den Linden, crossing into the former West Berlin, is a memorial to the victims who died trying to escape East Germany. Just to the south is the Holocaust memorial that couples an exceptional historical exhibit with a moving memorial of stone. The Reichstag (where the German parliament meets) is a mix of modern and classic architecture and is right next to the beautiful Tiergarten park. Berlin doesn't necessarily get the attention of other European capitals like Paris, London and Rome. But if you've already been to these cities and are looking for a new and different take on Europe,Berlin is an excellent option.